Most of the arguments California's top insurance official made in his letter Wednesday opposing the CVS-Aetna merger involved complex analyses of the pharmaceutical and health insurance markets. One of them, though, stood out in its simplicity: They haven't promised to lower health insurance premiums. "CVS expects that their merger would "yield hundreds of millions of dollars in medical cost savings, which could be passed on to consumers in the form of lower health premiums," Insurance Commissioner Dave Jones wrote in his 15-page letter urging the U.S. Department of Justice to sue to block the deal, underlining the word 'could.' "However, despite these savings, CVS-Aetna continues to refuse to commit to pass these savings on to consumers in the form of reduced premiums." Although pharmacy giant CVS Health and health insurer Aetna told Jones their proposed merger would yield $750 million in savings in its second full year and $2.4 billion annually by the fifth, they didn't explicitly commit to lowering premiums. "CVS commits to allocating a portion of those savings to lower health insurance premiums or to limit the size of increases in premiums," Steven Whitmer, an attorney representing CVS-Aetna, wrote in a letter to Jones. The letter went on to explain that it's too early to determine what savings members would see. Jones doesn't have direct authority over whether the deal closes, but he has a history of arguing against mergers that ultimately fell through. He also asked the DOJ in 2016 to block the proposed merger between Anthem and Cigna after finding it violated federal antitrust guidelines, which the DOJ did successfully. He did the same following his review of the proposed Aetna and Humana merger, which the DOJ successfully blocked. Jones only approved Centene's acquisition of Health Net in 2016 after imposing stringent requirements on the combined entity. Those deals, Jones pointed out in his letter to the DOJ, were horizontal, meaning they involved competitors in the same industry. The proposed CVS-Aetna merger, by contrast, is predominately vertical; involving entities that do not directly compete. "Consolidating the retail and PBM services of CVS with a major health insurer may have an adverse effect on the ability of other health insurers to access these suppliers, hindering their ability to compete in, or enter, the California insurance market," Jones wrote. "Such anti-competitive impacts could hurt California consumers." 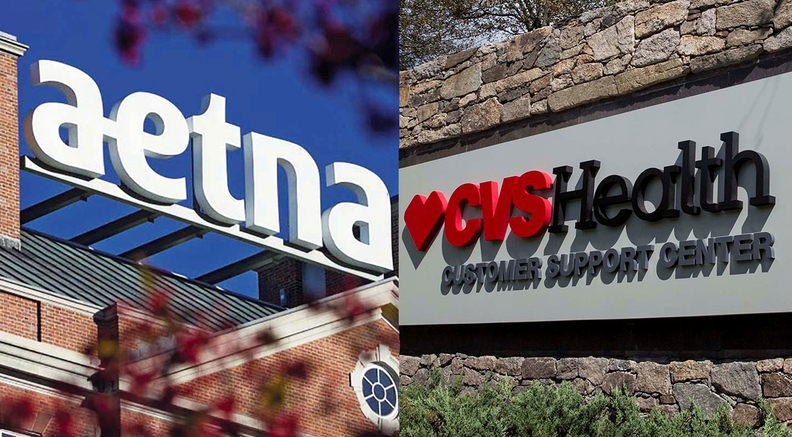 For their part, CVS and Aetna said through a spokesman they disagree with assessments of the merger by Jones and a number of others who spoke at a June 19 hearing on the subject. CVS spokesman Mike DeAngelis emphasized in an email that Jones does not have direct approval authority over the deal. At the heart of the disagreement between the companies and the deal's opponents is how much competition would exist in the PBM, drug store and health insurance markets after the merger. In a letter to Jones on behalf of CVS and Aetna, Whitmer wrote that the companies were "deeply troubled" by the opponents' testimony at the June 19 hearing, which he said was "directly contradicted by the facts." Among the testimonies the companies disputed was that of Richard Scheffler, a health economics and public policy professor at the University of California, Berkeley, whose assessment of the deal was supported by the American Medical Association, which also publicly opposes the deal. Scheffler studied how the merger would affect California's Medicare Part D standalone prescription drug plan market, which has 2.3 million enrollees statewide, and concluded it would have "important and significant impacts on the concentration" and would likely raise premiums across the country, including in California. In his letter, Whitmer wrote that when viewed properly, Scheffler's findings show that the market is not highly concentrated. Whitmer wrote the company would face "substantial competition" in the Part D market, and that there are eight firms selling such plans in every CMS region, including Cigna, Express Scripts, Humana and Rite Aid. "These participants are large, well-funded, sophisticated firms that compete vigorously to serve the rapidly growing senior population," he wrote. Jones argues the merger would disincentivize CVS to lower the cost of prescription drugs and pass on the rebates it negotiates with drugmakers to insurers that compete with Aetna. He said rival health insurers could be excluded from the market if CVS refused to contract with them or increase the amounts it charged them. Jones also cited an analysis by University of Southern California health policy professor Neeraj Sood, which found that if CVS-Aetna lost a PBM customer post-merger it would equate to approximately $23 in lost profit. A gain of a health insurance customer, by contrast, would result in about $323 in profit. "This results in a single insurance consumer being as valuable as fourteen PBM consumers, thus providing a strong incentive for CVS-Aetna to disadvantage competing health insurers in its PBM practices," Sood concluded. But Whitmer countered that CVS-Aetna would still expect to compete for health insurers in the PBM business. On the insurance side, Anthem and Kaiser Permanente each have 22% market share in California, almost four times that of Aetna's. "The facts show that CVS is not a "dominant" PBM or pharmacy, that Aetna is not "dominant" in health insurance," he wrote, "and that the combined firm will have every need and incentive to compete vigorously to the benefit of consumers in all markets."